Ice Center in Eau Claire. The Eau Claire Figure Skating Club invites everyone to “Come Sail Away” with its 36th Annual Ice Show April 10-12 in Hobbs Ice Center. This year’s theme is sure to warm up the audience, even in the icy arena. Nancy Girst has been coaching skate teams for the Eau Claire Figure Skating Club since 1981 and is also a board member. She said what makes the ice show different than other performances throughout the year is its focus on the whole group (rather than individuals) as well as its theatrical aspects. Each of the three groups of skaters, ranging from beginners in the Learn-to-Skate program and then junior and senior skaters, do two performances. In addition, most of the coaches do a number, a whole club performance opens and closes the evening, and there are several individual performances. For this year’s performance, Girst said they have collaborated with the Chippewa Valley Theatre Guild and will be having a cast member sing a song from the troupe’s upcoming production of Joseph and the Amazing Technicolor Dreamcoat. While he is singing, a group of the skaters will do a synchronized performance on the ice. Girst said this is beneficial for both the club and the CVTG. “We’re going to one of their events and doing some advertising, and then we’re also going to be doing the same for them at our show,” she said. Steve Southworth, president of the Eau Claire Figure Skating Club, said the ice show is sort of an “end of the year celebration” for the club. It allows the skaters to showcase what they’ve worked on, but it’s also something they try to make entertaining for everyone, club members and the audience alike. 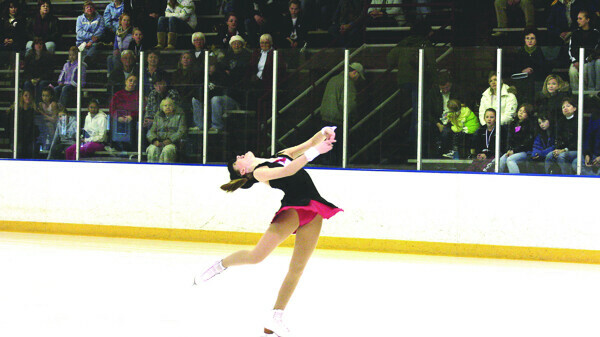 Jenny Robbins, a board member, said her daughter has been skating with the club for four years now and both of them really enjoy the ice show because of its relaxed atmosphere. “The really nice thing about this show is it’s the one time of year where they can showcase their talents in a non-competitive way,” Robbins said.